I think it’s a bit unfair that we usually pay lots of attention to ladies costumes and do not care too much about men’s costumes. So, now I suggest to take a closer look to what the Grand-prix finalists wore. Here are my fashion results of the men’s short program. 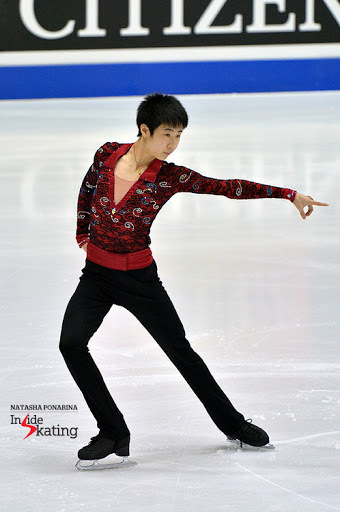 Red and black seem to be an inevitable color combination for tango in figure skating) Boyang haven’t been creative too. It’s a nice costume, that has right proportions, good fit to the program. I like the basic black trousers with a red belt. But I wish the shirt have been more refined and sophisticated. This sequins on the guipure look a little bit old fashioned. I’m not the biggest fan of such costumes but it was a nice and appropriate choice for this program. Wide sleeves with such ruffles on cuffs always look good, has a historical note and give some smoothness to the moves of arms. I also like the rope-like belt, great stylisation. I don’t like the collar but without it the shirt would have looked too simple. I’m also not a fan of a jumpsuits, especially on senior skaters. Yes, maybe it’s a comfortable variant of a male costume for the figure skating but it looks old-fashioned to me. 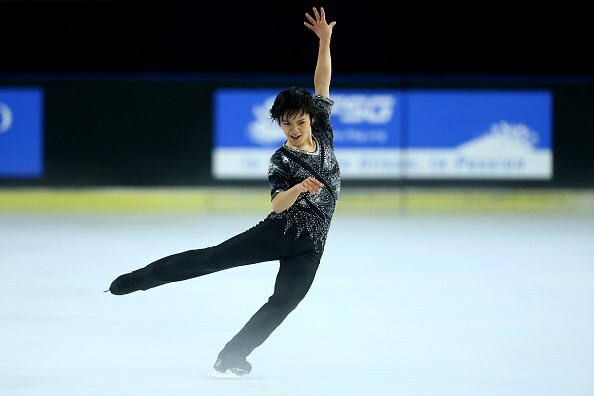 So, it’s good that Shoma’s costume at least has an impression that it’s a trousers with a shirt. I really like the top, it looks interesting with this geometric print and different shades of grey. The costume fits well the music and choreography. But Shoma need to be careful with the proportions of his costumes. He can’t afford to prolong the shirt on trousers because it make his torso look bigger than his legs. 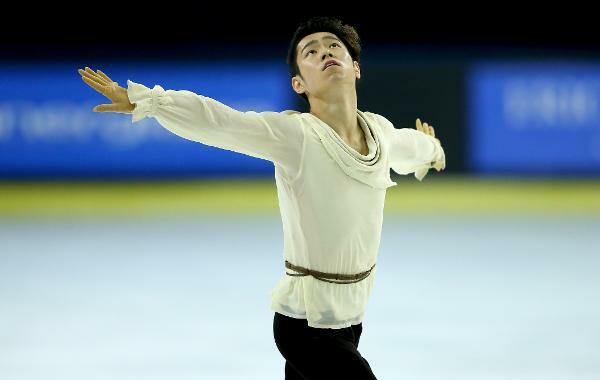 I have told it over a million times but can repeat once more: “I like when a men in figure skating looks like a men.” Thank you Patrick for your simple costume. Real clothes is still a trend in figure skating fashion. I like the color of the sweater it looks nice in combination with grey trousers. But I wish this sweater have been not so wide. 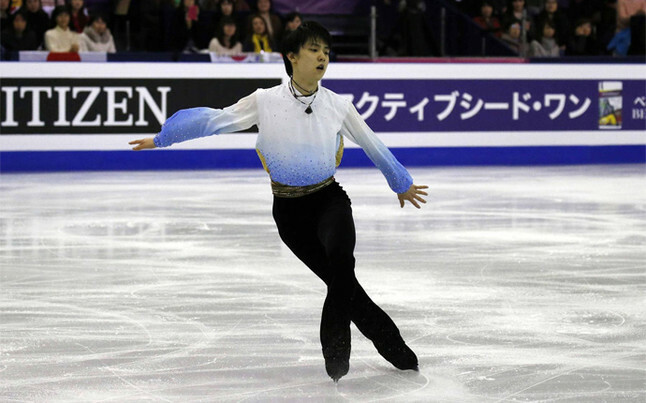 Yuzuru had a beautiful costume for the short program last year, so I’m not surprised that he didn’t go with a completely new one. He choose the second option. The idea and main colors is the same, but he refreshed it with golden inserts. Sky-blue and gold – beloved combination of the painters of Renaissance. The golden inserts also look well with his belt. Gorgeous romantic costume. 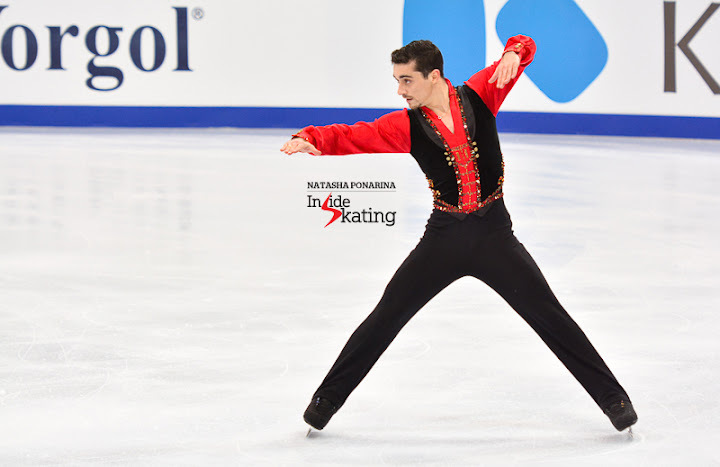 Javier’s costume for the Spanish short program I have already called as best male costume at the grand-prix he participated and discussed it here and here. We have another traditional combination of colors for such program but the costume look impressive. Right proportions, emphasizes the beauty of Javier’s body. Moderate amount of finishing, so the costume doesn’t look heavy or too theatrical but he still has an expensive look. I like the shape of the sleeves they are really highlight the arms movements which is important in this program. You can also see my fashion results of the ladies and pairs short program at Grand-prix Final in Barcelona.